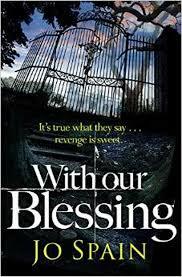 BleachHouseLibrary.ie: Book Review : 'With Our Blessing' by Jo Spain. When a newborn baby is snatched from its mother's arms, in 1975, it destroys the life of a young woman and causes ripples of trauma down through the years. But she is one of many, and goes unnoticed, like them all. Dublin author, Jo Spain, has debuted with gusto. This is not only another crime fiction book, in an already busy genre, it is a character based novel with a good bit of bite to it. DI Tom Reynolds is a protagonist that lingers. A good family man, not perfect, yet likable. Thankfully, he is not like other 'troubled' Inspectors. No drink problem, no sneaky cigarettes, no lusting after his female partner. and no shady dealings within the force. Just a genuine guy, doing his job, missing his wife and worrying about his daughter. This is refreshing, as a lot of crime fiction has the angst-ridden hero who battles inner demons alongside their cases. Not so with Tom. He has a great team, male and female and a comical driver to add to the mix. The make up of the investigative team is well rounded, with plenty of scope to feature them in subsequent novels. The narrative is strong. While we are all aware now of the horrors behind the walls of the Magdalene Laundries, the author somehow manages to make it feel fresh and sharp. There is no blurring of facts, or large canvas brushstrokes. It is focused and fair. There is balance added with the stories from the nuns too. Far too often there is a general dogmatic approach to the sisters who worked behind these walls, although it is known that there were individuals who were also horrified with the circumstances in the laundries. Jo Spain acknowledges these nuns and yet still portrays the events with fact-based honesty. With Our Blessing is published by Quercus and is available in paperback and ebook format. You can order your copy, with Free Worldwide Postage and 23% discount, here. Sounds good. I'll be looking out for this author.